It doesn’t happen often, but we scored this movie (initially without knowing) the same as the average IMDB voters- an 8. A Quiet Place was not even an unsure or uneasy 8… instead, it was a solid, heartfelt one. 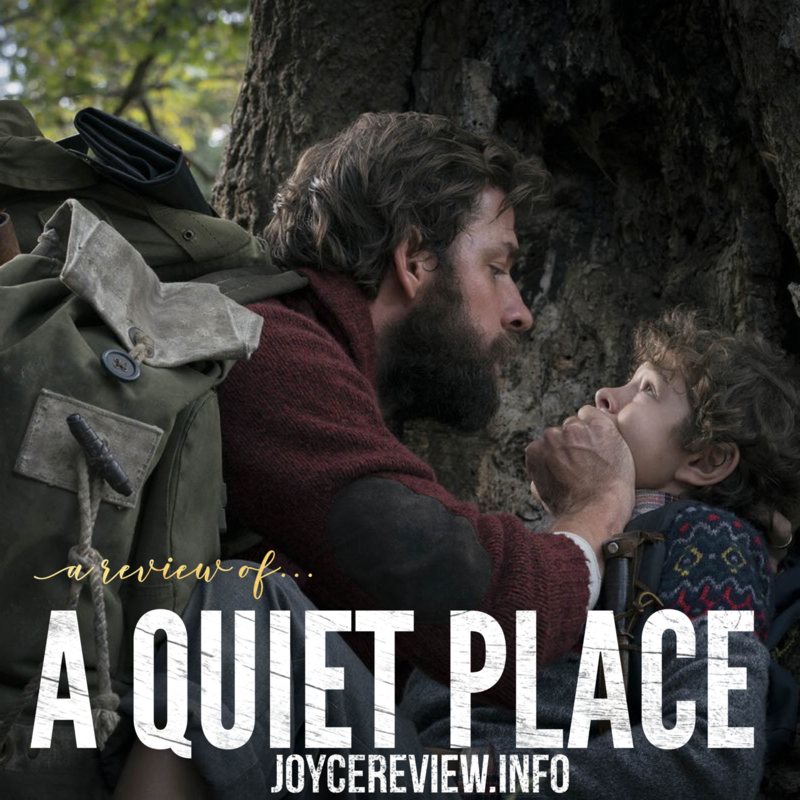 A Quiet Place is the story of a family of five who must live in relative silence as particular sounds attract deadly creatures; grotesque monsters that have overrun the planet. John Krasinski (of The Office fame) and Emily Blunt (who are also married in real life) play parents that are doing everything they can to keep their family safe. From padding their walking path with sand to marking the planks of wood susceptible to creaking, they try to eliminate any sound that might attract one of these creatures. Silence, especially in this film, does nothing but build a sense of tension. Will they accidentally drop a pan, step on a twig, or God forbid one of them talks in their sleep? This movie was superbly done. The acting, screen play and directing (which was all Krasinski) was especially brilliant. Emily Blunt was phenomenal as her role demanded a bit more in terms of fear, shock and pain. If anything went wrong with this film, it did so in the third act. It is hard to describe without giving away spoilers…however, let’s just say that the ending may come to a surprise to movie goers – I even heard a chuckle or two from the audience, probably from disbelief. Not that I disagree with the ending, but I feel that certain elements such as driving a truck down the driveway and (small spoiler!) certainly having a baby are situations when death is (at least should be) guaranteed. But I understand the reasons behind many of these moments. Like many horror films it gets you thinking, “Well, I would have done this, this and then, this.” Despite what you may or may not have done, there remains a logical reason why things were done the way it was in the film. Hence, it’s no surprise that A Quiet Place has reached it’s high marks. It has already grossed over $50 million dollars. There are many types of horror, and though the fans of gore my scoff, this is about as good as it gets when it comes to an “edge of your seat thriller”… certainly one that borders on horror and science fiction. My advice… do see it while it is still in the theaters. The scares and chills are always bigger there. Follow me on Instagram as every 3rd picture post is a new review! Click on the image below. The main character of Dune is 15-year old Paul Atreides (played by then, 25-year old Kyle MacLachlan) a boy born in line with a prophesy, in royal House Atreides on Planet Caladan. When the Emperor asks the Duke to rule over the most important planet, Arrakis, the Duke’s enemies move in. Arrakis, also known as Dune, is the only place in the universe capable to produce the mind-altering drug known as the Melange. This drug, commonly referred to as “Spice” is a vital element to the economy, those who use it medicinally and for space travel. I must begin this review by saying it is slightly biased in that Dune IS my favorite book of all-time! The magnificence of this film by director David Lynch is that it used the book quite well (minus the ending). The “failure” of this film though (I feel) was because it was too intellectual for mass audiences. They wanted it to be “a Star Wars for grownups” but after its poor box office numbers and critics like Roger Ebert trashing it….it never took off. When championing this film I talk about everything from it’s amazing star power (José Ferrer, Francesca Annis, Jürgen Prochnow, Linda Hunt, Everett McGill, Max Von Sydow, Sean Young, Sting and more) to the tremendous production (Anthony Masters) and costume design (Bob Ringwood). To top it all off, Brian Eno and the 70s rock group Toto made a perfect theme and film soundtrack which ranks in my Top Ten. Where I mark the film down is on the choice of ending, which I hear is more of the studio’s fault than anyone else’s. Just another in a long list of films showing that “those with the money have the final say.” This ending was basically the only, but obviously the biggest, deviation from the book. Secondly, while I think the visual and special effects did a superb job (for 1984) the climbing and riding of the giant sandworm could have been a lot better – Especially when Stilgar (played by Everett McGill) was climbing the rope up to the top of the worm. 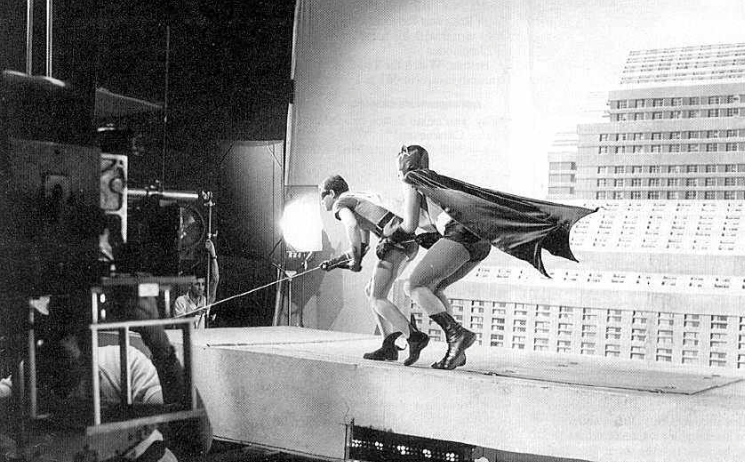 It reminded me of the old Adam West Batman (pictured below). If you’re going to use the old way, make it look believable Stilgar! The rest of the film was the epitome of EPIC in my opinion, with the only real sadness being that they couldn’t continue with the other books. Obviously they made the tv mini-series of Dune, but one look at the set production and you’ll think that it was put together by a high school drama class. Maybe that’s being too harsh. I must say however, I did like James McAvoy as Leto Atreides II in Children of Dune. Dune (the movie, not mini-series) IS a deep and intellectual film, and though it won’t be for everyone, it is a film that (at least) all sci-fi fans need to see once. But for God’s sake, read the book! And when you do… we’d love to hear your thoughts. What was your impression of the film? Did you have a favorite scene?… A favorite quote? Let us know what it is!!! Be sure to follow on Instagram @chencenter ! Every third picture is a movie review and will (afterwards) be posted here. See and comment on it first on Instagram. I’m averaging one every week. The off-the-wall irony is, might you guess, that I’d actually rate this picture 8 and 1/2. It’s a shame though, that The Joyce Review is prejudiced against fractions. Their bourgeois nature offends me and so, we’ll round it off at a solid and majestic 8. Hailed by Roger Ebert as “the best film ever made about filmmaking” 8 1/2 features Guido (Marcello Mastroianni) as a famed director working on his latest masterpiece. It is to be an epic picture, part science fiction and part commentary on Catholicism. [Damn you fractions!] The worst part is that he has completely lost his artistic vision and is constantly pestered by producers, writers and would-be actors to make the needed directorial decisions. He shirks and flees to the realms of memory, dream and fantasy to search for answers. Just like the story’s hero (Guido), Fellini was riding the high-wave of success from his previous film, La Dolce Vita (1961), when he is thrown into a common artistic conundrum of how to top the last. In a Seinfeld-esque move (“I’ve got an idea for a show.” What’s the show about? says the other person. “Nothing!”), Fellini takes his actual feelings towards the artistic struggle and places it on the head of our hero, like a sacrificial goat, and sets him loose to create a picture that “Is what it is”… as aimless and scattered as reality but as cerebral and poignant as a dream. 8 1/2 is a highly visual picture that intends to evoke through the use of style and imagination. It’s an inner-space odyssey in which the story begins with the main character (Guido) as he is trapped in traffic, becomes asphyxiated, and (in one of my favorite scenes of the film) floats into the clouds only to notice that he is not free; in fact, he is a human kite being reeled in by his peers at the shore. They tug at his kite strings, he loses flight and plummets towards the surf. He awakens suddenly to find himself in a spa in Rome. With this strong opening scene, 8 1/2 begins a journey through the mind of the director (and of Fellini) and his interactions between his sultry and materialistic mistress (Sandra Milo) and his intellectual wife (Anouk Aimee); those that obnoxiously clamor for his attention (producers, writers & actors) and those whose attention he would give willingly. It’s a battle between the primal and the spiritual and of desire and obligation. At times, a beautiful muse appears (perhaps one of the loveliest faces I’ve seen on the silver screen, Claudia Cardinale) and in her delicately calm manner, tries to reassure him that all will be forgiven. The Visionary is the only true Realist. In one of the more famous scenes in cinema history, we encounter a dream in which Guido is surrounded by a harem of women from his past and present, and they all forgive and love him. But the harem has rules, and one of these rules is that once you turn 26, you must move to the second floor. As one lady pleads to stay, she slowly starts a revolution amongst the aging women. Quick to keep them in line, our fedora-wearing hero pulls out a whip in a futile struggle to keep them obedient. 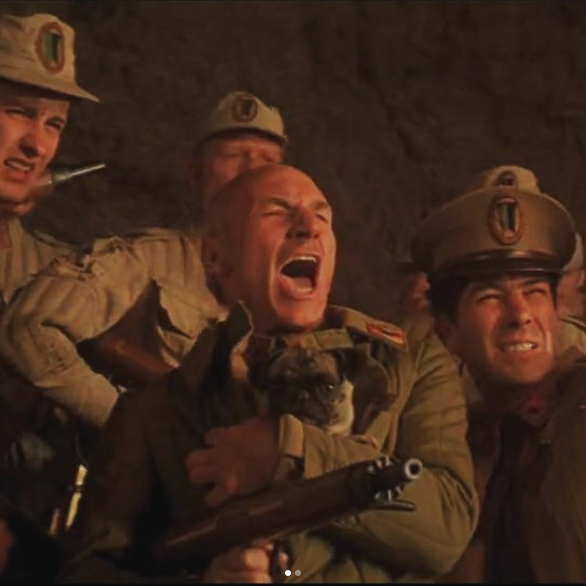 It had occurred to me that the creatively-minded duo Steven Spielberg and George Lucus must have taken ample notes in this harem scene to create the famous introduction of Harrison Ford in Indian Jones and the Raiders of the Lost Ark. From the shadow image of our hero wielding a bull whip, wearing his sentimental fedora (iconic and important to his identity), to the darkened close up of the hero himself – Spielberg and Lucus reconstructed Guido’s daydream in dynamic and captivating fashion. 8 1/2 is a superb film that, although brilliantly artistic, can be tiresome for modern audiences. An intellectual and mind-bending piece, I suggest that the viewer sit down and view this when he or she is best receptive to thinking. Being slightly intelligent yourself is also a requisite. If you’re a dum-dum, and need to start a bit lower on the totem pole, might I suggest Total Recall (a science fiction, dream/reality shifter) for the less cerebral.